In southern Louisiana, about an hour west of New Orleans, the Atchafalaya River is king. This “long river,” as the local Attakapas Indians called it, stretching over 125 miles, engendered Morgan City’s growth as a center of trade. The city was originally named Brashear for Walter Brashear, the Kentucky sugar planter who settled there. After the Civil War, steamship entrepreneur Charles Morgan’s efforts transformed the river town into a center of trade for fur, cypress timber, and seafood. The city was renamed Morgan City in his honor in 1876. In the 20th century, oil raised Morgan City to prominence in Louisiana. More than anything else, the predominantly Catholic city, located within a distinct Cajun region, is famous for its “jumbo” shrimp. Among such a distinct culture foreign to their own, Jews lived and thrived in Morgan City. Jews in Morgan City came from Prussia, Germany, and France in the 19th century, drawn to the French culture of the Cajun region and the economic opportunities of trade along the Atchafalaya. By all accounts, Jews were present in Brashear even before the Civil War. The proof for their presence lies in the cemetery located in the neighboring town of Berwick. Albeit damaged and faded by age, one grave reads: “Eugene C. Kahn, born in Morgan City March 27, 1860, died in New Orleans January 16, 1882.” The birth of a Jewish child in 1860 is not the only proof that Jews were in Morgan City in the mid-19th century. The existence of several Jewish businesses in Morgan City also indicates the presence of Jews along the Atchafalaya. Among the more famous ones were those run by Leopold Loeb and Jacques Lehmann, but there were certainly other Jewish business owners, including Ed Plonsky, A. Heymann, M. Goldstein, M. Kahn, and N. Solomon. Leopold Loeb was born in Bavaria in 1839. As a teenager, he came to United States and with his wife, Amalia, raised seven children in Morgan City. Throughout his life he owned several businesses, including a grocery store, a dry goods store, and a furniture store. In fact, in Morgan City’s first city directory after the name change, Loeb took out an advertisement for his St. Mary’s Store and Saloon, established in 1854. Loeb was by no means the only Jewish businessman to take out such ads. The directory also includes ads for T. Lehmann’s fruit shop, Hy Neuberger’s grocery store, Kling’s lumber store, and the dry goods stores of German-born Isaac Reinauer, French-born J. Louis Gougenheim, Leon Cahn, and Blum. Jacques Lehmann and his wife, Elizabeth Levy, came to America from France in 1870. According to their descendants, the couple came to Brashear because their uncle was already well-connected in the city. His name was J. Louis Gougenheim, a fellow Frenchman who had arrived in the United States just as the Civil War was breaking out. Jacques Lehmann became successful in his new environment, even trying his hand in the oyster business, and also gained community respect as a city councilman and member of the Brashear Lodge of the Knights of Honor. Lehmann was not the only Jewish businessman involved in the unkosher food business. Among the more famous Morgan City Jews of the 20th century was Hyman Salz, a fifth-generation German who made his living as an alligator fisherman. Evidence suggests that there were Jewish worshipers in Morgan City even before the Civil War. However, formal prayer services were only established in the 1870s. 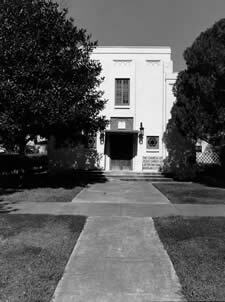 In fact, the year before Brashear became Morgan City, the small Jewish community in this Cajun town decided to organize a congregation. In February 1875, the newly formed congregation began plans to build a synagogue in Morgan City. The following month, the local newspaper reported that a Grand Calico Ball was being held to raise money for the building’s construction. Involved with the event were community members M. Goldstein, H. Neuberger, L. Cahn, Charles Lehmann, L. Levy, G. Wildenstein, and L. Bernheim. On June 26, 1875, Congregation Shaarey Zedek on First Street was completed and dedicated. The synagogue’s first ordained rabbi was Rabbi Sigmund Lobenstein. Sadly, the rabbi and his wife and sons all died in October 1878 of the yellow fever epidemic that prevailed in Morgan City. That left the nascent Shaarey Zedek in a bind. For the time being, Isaac Reinauer served as President and Leopold Loeb led services, which were held exclusively on Friday nights and Jewish holidays; Loeb was lay leader until his death in 1921. Loeb’s wife served as President of the Ladies Aid Society. Over the years, the congregation was also served by Rabbi Aaron Levy and Rabbi Mayer. The temple was Conservative, though that term was not relatively meaningful; services were conducted in Hebrew. In July 1901, the congregation endured its first true test when a fire destroyed its synagogue. At the time of the fire, there were approximately 35 Jews in Morgan City. M. Gougenheim served as Temple President, which had 15 member families. According to one of his descendants, Sol Loeb (then 26, and son of the acting rabbi) rushed into the burning building and saved the Sefer Torah, which was used in the new synagogue. Following World War I, the Jewish community of Morgan City, and neighboring Berwick, reached its zenith, numbering 220 and 21, respectively. When Leopold Loeb passed away, two changes occurred within Shaarey Zedek. First, Leon Kahn took over as acting rabbi, though he too died the following year. More importantly, after 1922, the congregation was no longer Conservative, instead reorganizing itself as a Reform temple. Reform Judaism better fit the lifestyle of these second and third generation Jewish immigrants living on the southern coast of Louisiana. 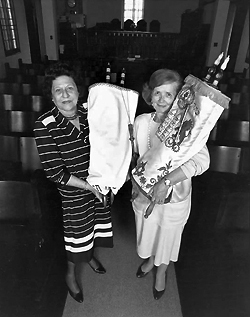 During that transitional period, Sol Loeb served as the synagogue’s president and Paul Schreier was elected vice president. In September 1928, the congregation decided to move to a more residential neighborhood. After selling the property on First Street, they built a new synagogue on a tract of land on Third Street that Maurice E. Norman had donated to the congregation. Norman was a prominent local Jew who had served as Mayor of Morgan City. Norman was elected in 1922, the first mayor elected after passage of the 19th Amendment gave women the right to vote. Norman had also been crucial in the organization of the First National Bank of Morgan City 20 years earlier, along with fellow Shaarey Zedek member Charles Lehmann. Norman was by no means the only politically active Jew in the city: Sol Loeb and Henry Loeb had both served on the city council. Thanks to Norman’s generosity, the new temple was dedicated on Sept 23, 1929. The community, though now numbering only 97 Jewish residents, had a new home for Shaarey Zedek. The two-story concrete building was immediately recognized as an architectural gem, and services were held in the magnificent upper main floor. The congregation also served people from nearby towns, such as Franklin, where 25 Jews lived in 1937. Jewish merchants had successful businesses in Franklin. Isaac Popkin established Popkin's Jewelers in Franklin in 1892. His descendants continued to run the store until 1995. In 1908, Abraham Friedman founded the Franklin Racket Store, which later grew into the store A. Friedman & Sons, which remained in the family for three generations. By 1937, the Jewish community of the area was in decline. Only 65 Jews remained in Morgan City; only 13 in Berwick. Surprisingly, the city experienced a post-war Jewish resurgence. In the years immediately following World War II, the Jewish population of the city doubled. In the early 1960s, Rabbi Leslie Sirtes served the congregation jointly with Gates of Prayer in New Iberia. He left in 1965, after which Shaarey Zedek had student rabbis from Hebrew Union College. Under the leadership of its president, Richard Loeb, Shaarey Zedek experienced a resurgence in the 1960s. Its religious school, headed by Mrs. Sol Loeb, included Mrs. Leonard Roes, Mrs. Joe Finkelstein, and Mrs. Estelle Kahn as teachers. Shaarey Zedek’s activity could not counteract demographic decline. The Jewish community of Morgan City continued to shrink during the last few decades of the 20th century. The congregation has declined as well. In 2008, only about eight Jews remained in Morgan City. Despite their small numbers, Shaarey Zedek continued to meet for major Jewish holidays in the upstairs sanctuary of their synagogue. Leo Kahn acted as lay reader, while Al Lippman often helped him. Rather than selling the building, the remaining members of the congregation decided to rent out their synagogue to local churches and organizations. By 2013, the congregation had become defunct, and the remaining members decided to sell their building.